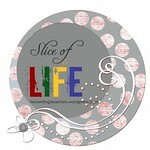 This is my 29th post for the March Slice of Life Challenge - hosted by Two Writing Teachers. Stop by! Umm… what was I saying? Right, the one little word. I can’t locate the link right now, but rest assured there were hundreds of possible goal words to choose. I considered, hemmed and hawed, and then promptly forgot all about it. As I think back over this month, and all the words I’ve spewed forth in my daily Slices, I’m even more positive that was what I selected. Positive, of course, because that means that I’ve actually accomplished a lot in pursuit of that goal. After this month is over, I think I’ll go back through them all and see just how many words I generated on my posts alone. Countless more crossed my screen in the form of comments. You can’t really tell right now, though, because of all my blog trials and tribulations. I’m hoping those of you who read my posts and use Blogger can be my PLN as I try to work out the kinks of this new engine. I’m really hoping I can find a way to repost all my old posts, because I was proud of a lot of them. I now know I can write every day. Perhaps it’s time to dust off some of those rough draft stories and poems I abandoned over the years. Perhaps I need to reawaken the characters that have been sleeping in the back of my mind. Perhaps, once I do that, I can convince someone out there to make my stories come to life on more than just my blog. Who knows?